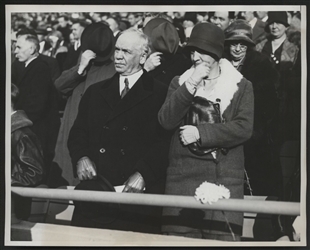 Shown here with Secretary of War and former Chairman of the House Appropriations Committee James W. Good, Representative Ruth Hanna McCormick of Illinois watches the 1929 Army football game against the University of Illinois. McCormick likely left the game happier than her companion after the Fighting Illini beat Army, 17-7. Elected to the House based on her significant political experience as a Chicago lobbyist and party organizer, and a motto of “No Promises and No Bunk,” McCormick served from 1929 to 1931.